But how to make your costume go from “nice” to “wonderful”? It’s all in the accessories. What would your Elizabethian dress be without the starched ruff, or your 18th century Anglaise without the headgehog-hair/wig. 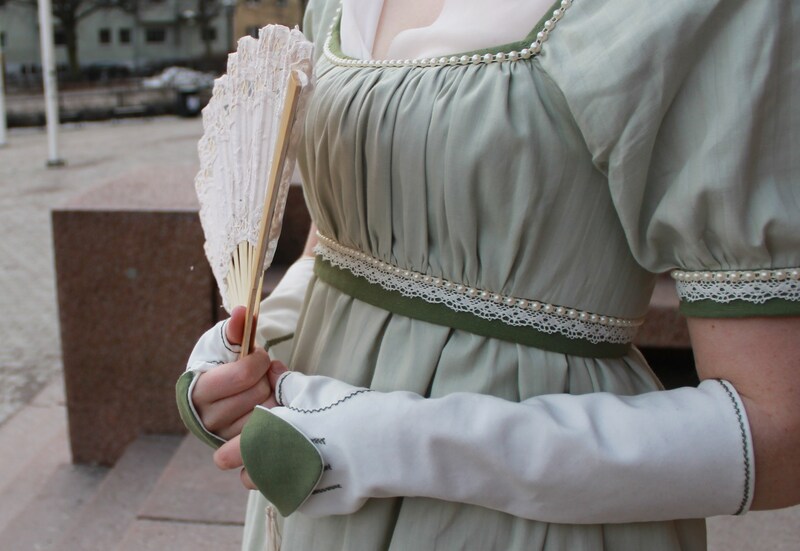 So for the HSF challenge 7 “accessorize” I decided to style my new Regency gown (which I made in the 6th challenge) with some matching accessories. But what would I make? 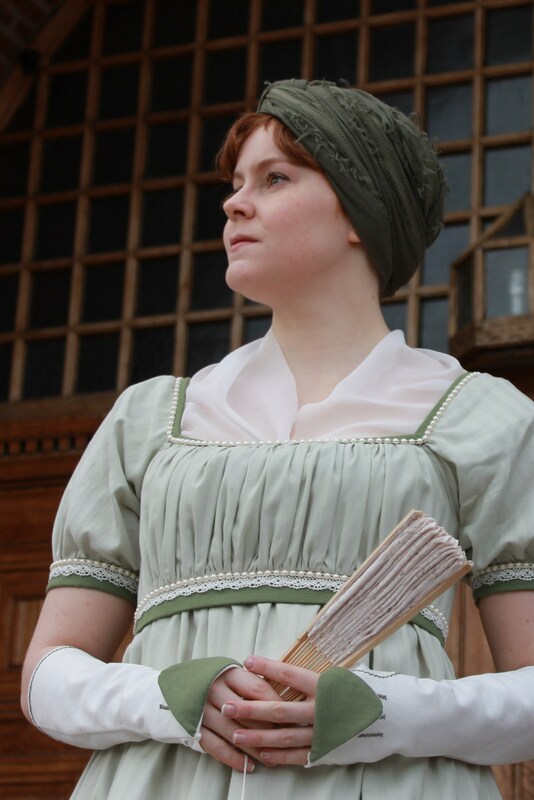 There are so many things the proper Regency lady would need. 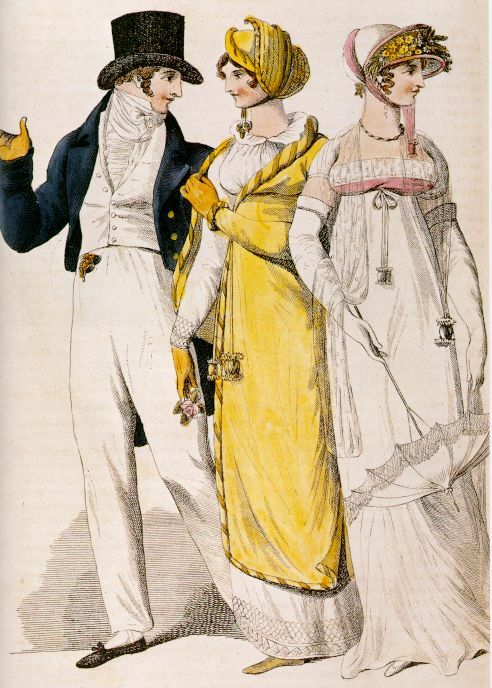 … shawls, bonnets, gloves and parasols. I decided to prioritate headwear – since my hair is cropped in a boyish style I would never be able to arrange it in the curly up-dos so popular at the time. So instead I need to cover it up. I searched all the stores in town for a straw hat to make into a bonnet. But the sunbonnets was no where to be seen in the still cold and snowy march. 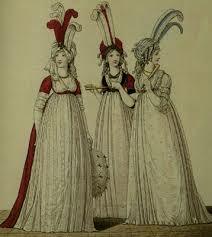 So I needed to re-think the bonnet and decided on the much simpler turban. 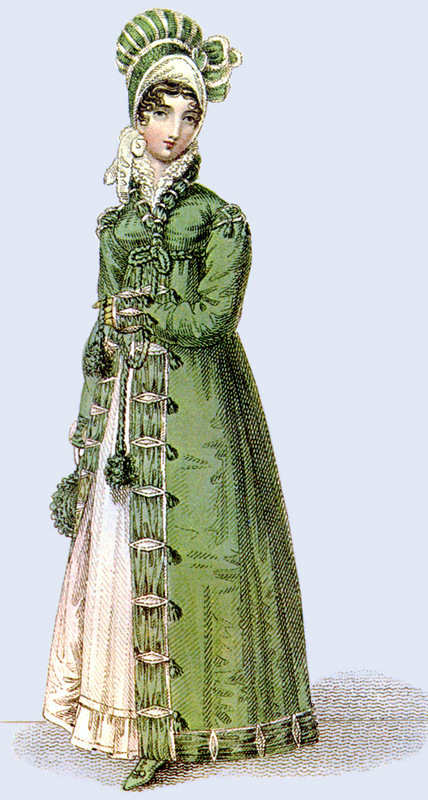 I bouhgt a shawl in a similar green color as the trimmings on my dress, and practiced wraping and pinning the turban to my head. The American Duchess has a great tutorial which I used to get the shawl to co-operate. 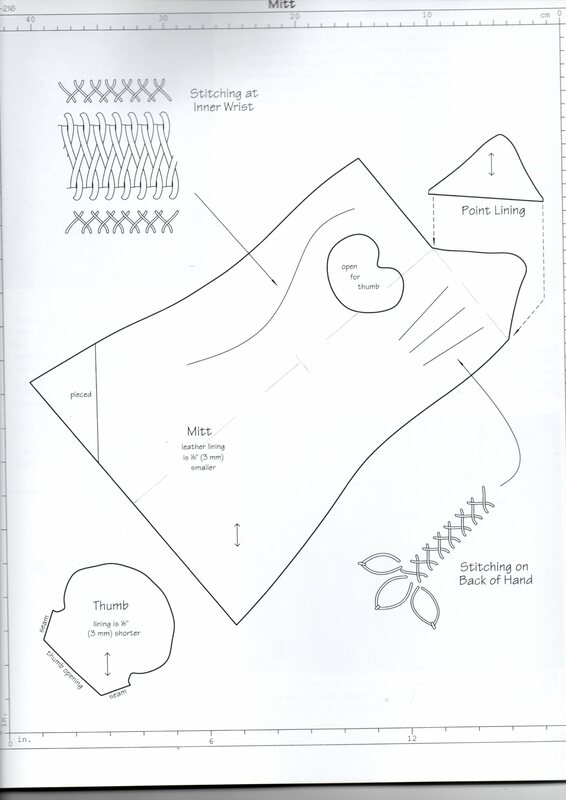 But since the turban seemed a bit too easy I also decided to make some gloves – or mittens to be exact. Using the pattern from “Costume Close-up”, I drafted and cut the pieces in an ivory cotton blend. 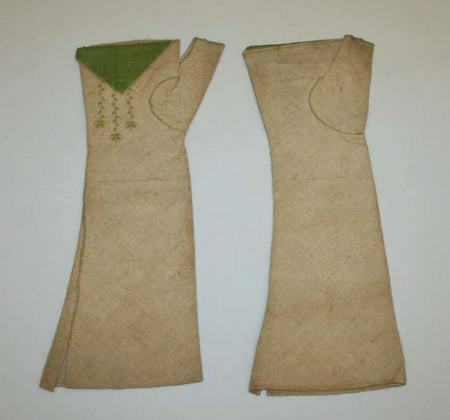 They are completely handsewn and decorated with green buttonhole thread and the same green linnen as for the gown trimmings. I also bought an ivory lace fan, and cut a big triangle of ivory organdy to use as a fichu (neck coverage) for the photoshoot. 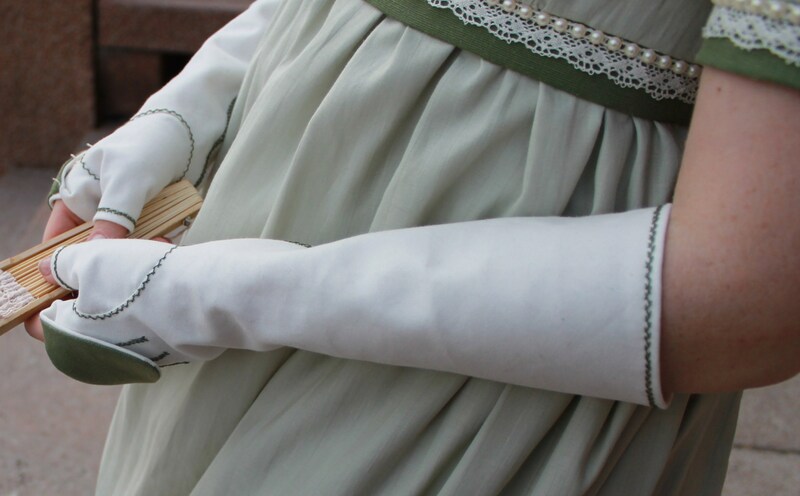 What: White and green Regency mittens. 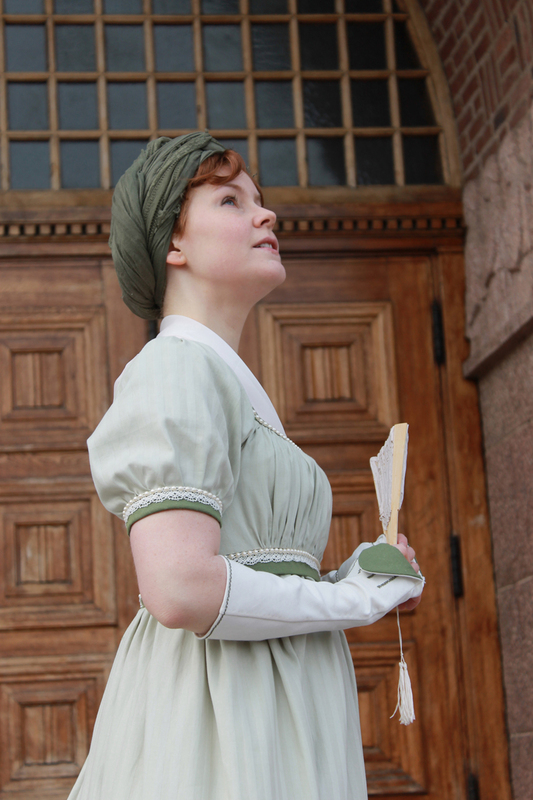 And my light entries – the green turban (a scarf) and white fichu (a hemed piece of organza). 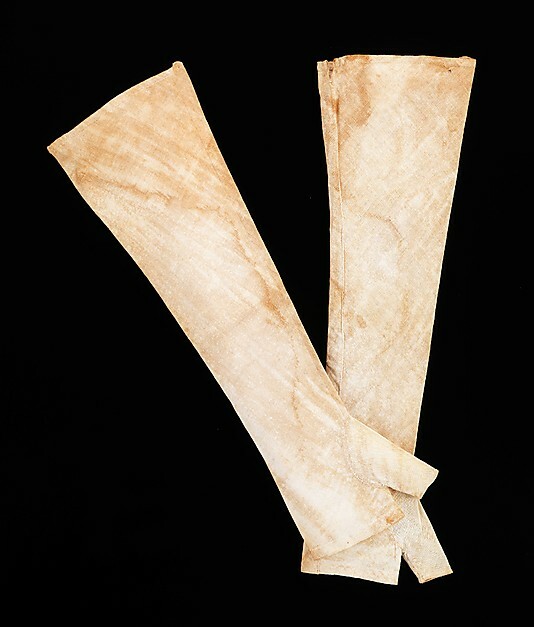 Fabric: 0,5 m cream colored, thick cotton fabric with a small soft nape. Pattern: “Costume Close-up” By Linda Baumgarter – Mittens. Notions: Pieces of contrasting green fabric, sewing thread and green buttonhole thread. How accurate: Pretty good – completely hand stitched with historical patterns and sewing techniques. So about 90 %. Hours: 6 hours – lots of decorative handstitching. First worn: On Gods friday when we had the photoshoot. Final thoughts: I love my mittens and plan to make lots of them in different colors and fabrics. I also noticed that the hostess of HSF The Dreamstess mentioned my mittens as one of her favourite accessories for this challenge.